The show's first ever national tour arrived in San Francisco this week, and it's a production that was created for Lincoln Center in 2016, directed by Tony Award winner James Lapine — a frequent collaborator with Stephen Sondheim who also co-wrote the book of Falsettos with Finn. Like Angels in America, which had its Broadway premiere in the same early 90s era and which was also just recently revived, Falsettos uses humor to deflect and cope with the horrors of the AIDS epidemic — and both plays conclude their second halves in hospital rooms. But where Tony Kushner's snappy-patter prose and inexhaustible intellect took a story of AIDS to a mythical and fiercely hopeful conclusion, Finn and Lapine's musical lens on the era wears its heart on its sleeve, using the emotionality of the medium to take us through one specifically devastating tale. 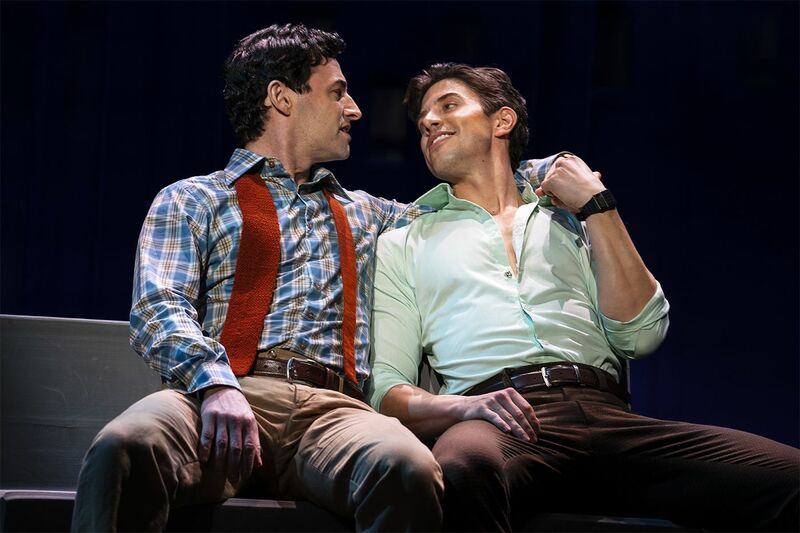 This production stars Max Von Essen as Marvin, Nick Adams as Whizzer, and Eden Espinosa as Trina, and the vocal chops of all three of these performers are undeniable and impressive. The show comprises two acts that were originally two separate but connected one-act musicals, March of the Falsettos and Falsettoland. Act One, therefore, feels something like a complete show, if a disjointed one — I'd argue that Finn was still experimenting and learning how to write a musical when he wrote March, and by the time he got to Falsettoland it feels like he truly hit his stride. As for the name, Finn says he was inspired by the idea of the falsetto — a man singing in his head voice outside his range — as a metaphor for people who exist "outside the normal range." In Act One, we meet the characters in 1979, just as Marvin has divorced his wife, Trina, and moved in with his lover Whizzer. Marvin and Trina are somewhat stereotypical, neurotic, middle-class Manhattan Jews, and Marvin ends up encouraging Trina to start seeing his therapist Mendel (Nick Blaemire), and then encourages their 10-year-old son Jason to start seeing him as well. Mendel ends up falling for Trina and marrying her, and while Marvin gets upset about this, it sets up the beginnings of a new alternative family as Jason bonds with Whizzer as well. Act Two introduces the "lesbians from next door" Cordelia (Audrey Cardwell) and Dr. Charlotte (Bryonha Marie Parham), who complete the family picture, and it skips ahead two years to where Marvin and Trina are fighting as they plan Jason's bar mitzvah. Also, Whizzer, whom Marvin breaks up with at the end of Act One, returns and reunites with Marvin at one of Jason's Little League games in what is truly an iconic Broadway musical number ("The Baseball Game"). And then, of course, since this is 1981, AIDS enters the picture, first with Dr. Charlotte's song about seeing the first patients ("Something Bad Is Happening"), and then someone gets sick. Finn's music — and there's a lot of it in nearly 3 hours with barely any dialogue that isn't sung — still feels fresh, odd, and energetic. In songs like "This Had Better Come to a Stop," "I Never Wanted to Love You," and "Welcome to Falsettoland," one hears both Finn's love for Sondheim-ian, minor-chord melodies, and his love for sweeping, beautiful ballads. There's also incredible wit and wordplay that rivals Sondheim in songs like "I'm Breaking Down" (the Act One barn burner in which Espinosa's talents are truly laid bare, and quaking) and "A Day In Falsettoland." And in his mastery of giving musical voice to neuroticism and angst of all colors, Finn stands alone — those quirky, angsty tunes also sit beside some of the most moving love ballads ever to come from a Broadway stage, like "What More Can I Say? ", "Unlikely Lovers," and "What Would I Do?" And none of this music is easy, even for seasoned pros, and this show is full of them. Adams is terrific as Whizzer and he and Von Essen harmonize gorgeously on their multiple duets. Parham and Cardwell then join them to stunning four-part effect on "Unlikely Lovers." Also, young Jonah Mussolino is very impressive as Jason (Thatcher Jacobs also plays the role at some performances), which is no minor role for a kid. It's hard for me to believe that I'm even writing a review of this show, which was something that I listened to incessantly and adored when I was 17 and discovering the more interesting corners of the musical theater universe. It remains an astonishing, amazingly strange, and immensely beautiful show, and Lapine's new production with its delightful puzzle-piece set by David Rockwell, is a must-see for Bay Area fans of great theater. It's also lucky that it's even here — this is far from a guaranteed commercial draw, and Finn's ambitious score still has its challenges, especially in the first half. But Falsettos is the stuff of musical theater lore, and hopefully it will earn some new fans among those who've never heard of it given that it is a very New York story that's rarely traveled beyond New York. It's also obvious how much the performers love doing it, given the rarity of musicals that are this packed with stunning solos and harmonies, and complex melodic moments that stretch and challenge their skills. "Being cast in this show is one of the greatest gifts I've received in my career," writes Eden Espinosa in a welcome note in the program. The passion on display through this production suggests that everyone feels the same way. Falsettos plays at the Golden Gate Theater through April 14. Find tickets here, and look for discounted seats for the April 5 performance on RushTix. The Medical Examiner's report following the autopsy of late SF Public Defender Jeff Adachi found that his cause of death was acute mixed drug toxicity.